Are you bored of viewing the same white or blank background in your USB or Pen Drive ? When you open your Pen Drive you always find a white background. Want something new... So today I will tell you a trick by which you can easily set a wallpaper as you like on your Pen Drive. 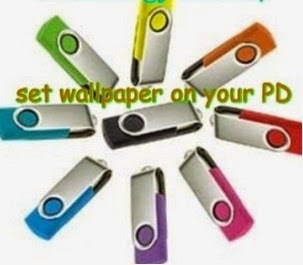 It is very simple trick to set a wallpaper on your Pen Drive. Using this trick you can easily set a colorful wallpapers on your Pen Drive. Now copy the below code and paste it in Notepad. Now Refresh and view the background. Now every time when you will open your Pen Drive it will show background as your wallpaper. NOTE: You are suppose to keep the image file on your Pen Drive. This trick is tested on Windows XP and VISTA. Hope it will work on Windows 7 and 8 also. Please do comment to tell us whether it is working on Windows 7/8 or not.